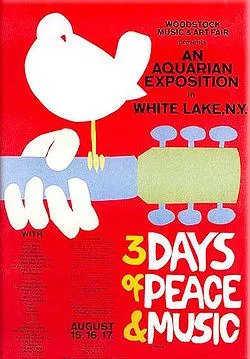 August 15 marks the anniversary of the “3-days of Peace & Music” held in 1969 at Max Yasgur’s 600 acre dairy farm in the rural town of Bethel, New York, southwest of the village of Woodstock. I’d like to do this, but I wasn’t there. However, I do remember it when it occurred. And of course, everyone saw the 1970 Academy Award winning (Documentary) movie — edited by a young Martin Scorsese. Sweetwater – the first GROUP to play at the Woodstock festival. Their music style is a fusion of rock, jazz, folk, psychedelia, latin and even classical music. Arlo Guthrie – son of folk musician Woody Guthrie, Arlo is famous for “Alice’s Restaurant Masacree.” He also played “Amazing Grace” and (somewhat inaccurately) told some of the history behind the song. It appeared in the 1969 movie “Alice’s Restaurant,” further re-popularizing it in the ’60s, to be followed by Judy Collins. Joan Baez – San Francisco Bay Area folk singer, social and political activist who once dated Steve Jobs of Apple. Country Joe McDonald – Country Joe & the “Fish” (Barry Melton) became popular for the “FISH chorus” associated with his Vietnam song, was a local favorite in Berkeley, where he lives, for anti-war rallies. John Sebastian – (of the Lovin’ Spoonful) I once caught him live when he was doing warm up for standup comedian Steve Martin. The impatient and unappreciative audience shouted Sebastian off the stage in preference of Martin. Sha-Na-Na – a New York ’50s revival and send-up band made up mostly of students from Columbia University, later made famous in the movie “Grease” where they appeared as Johnny Casino & The Gamblers. Santana – Carlos Santana is playing a residency in Las Vegas now. Grateful Dead – a popular Haight-Ashbury based band. I saw them once in Oakland. Even in an open air venue the smell of burning hemp was overwhelming. Janis Joplin with The Kozmic Blues Band – another popular Haight-Ashbury band. Sly & the Family Stone – Sly Stone was known as a popular San Francisco disk jockey. The Who began at 4 AM, kicking off a 25-song set including Tommy – I have seen the band perform live half a dozen times, including during the early ’70s when at the San Francisco Cow Palace drummer Keith Moom twice passed out into his drum set from a drug overdose. Guitarist Pete Townsend excused it as “It must have been something he ate. It’s your American food.” They’ve been performing now for over 50 years. Jefferson Airplane – the first of the San Francisco psychedelic rock groups of the 1960s to become internationally known, later changing their name to Jefferson Starship, and then Starship. Joe Cocker – dressed in classic tie-dye. Crosby, Stills, Nash & Young – formed by refugees from three 1960s bands: The Byrds, Buffalo Springfield, and The Hollies. The band is primarily known for their three-part vocal harmonies. The Summer of 2009 they were touring without Young. Where were you in ’69? You might get a kick out of my fictional rendering of the freaky events at Woodstock on August 18, 1969. Bill – like everyone else, I have the album, “Woodstock”. Only about 1/3 of the music you mention is on it (maybe less). Is there a complete recording anywhere? I’m afraid I do not know of any options for the whole list of Woodstock music.